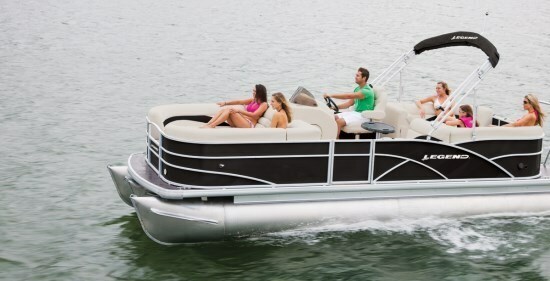 Legend Boats, officially launched in 1987, is a Canadian company headquartered in Whitefish, Ontario near Sudbury and offers twenty models of pontoon boats for 2013 in five series from twenty to twenty-seven feet. Legend offers another twenty-five models of aluminum fishing and Jon boats in four series ranging from twelve to twenty feet. 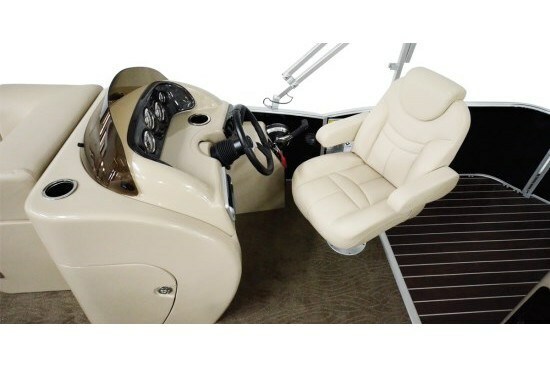 The five model Lounge series of Legend pontoon boats comes in two lengths – twenty-two and twenty-four feet, of which the Luxura Lounge subject of this review is a twenty-four foot model – twenty-four feet, two inches length overall to be precise. 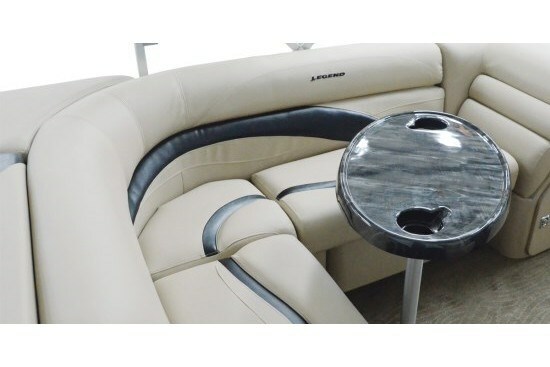 Being, in its own words, “the only Canadian boat company that shares all of their pricing in their catalogue and on their website,” Legend boldly displays Canadian pricing for the Luxura Lounge at $17,999. plus prep., admin., freight, and taxes with the base Mercury 15 EL 4-Stroke outboard and all standard equipment. 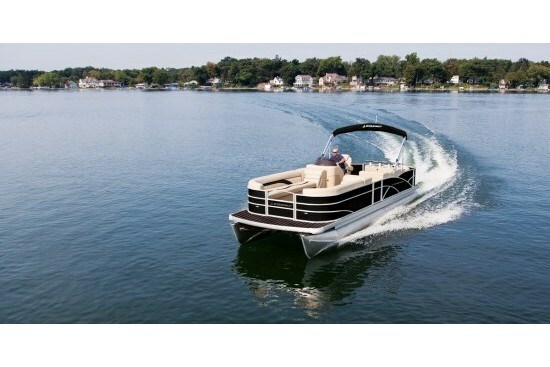 It also recommends the Mercury 60 ELPT EFI 4-Stroke BF as the most popular choice of motors for this boat for a $7,099. premium and you can choose right up to a 115 horsepower outboard. 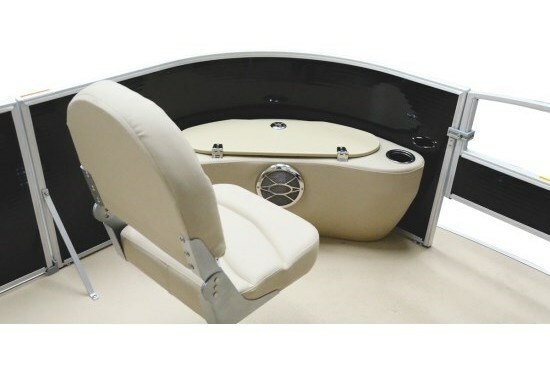 The Luxura Lounge rides on two, 25” diameter pontoons of .080 gauge aluminum, each with three separate, sealed, and pressurized chambers and full length protective extruded keels along their bottom surfaces. These keels also provide directional stability to the boat. The floor is made of ¾”, 7-ply marine grade plywood covered with “snagless” marine carpet within the fence railings and “rich mahogany and ivory” vinyl covering the front and rear decks for easy cleanup from watersports or other water-based activities. 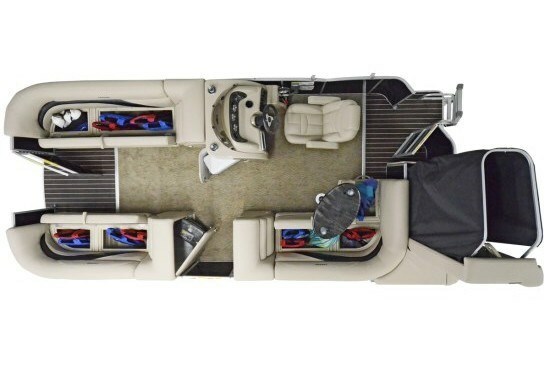 Legend refers to this rear deck area as an, “EZ-clean Rear Fun Zone for watersports and entertaining.” This rear deck also includes a starboard side boarding ladder. Three “EZ-Lift and Lock” entrance gates are provided on the Lounge – at the centre bow, centre stern, and port side. The surrounding fencing material is anti-vibration foam backed. The interior layout is practical and effective with a comfortable two or even three-seater chaise lounger with rounded corners and angled backrests at each corner – two facing forward at the bow; two facing rearward at the stern. 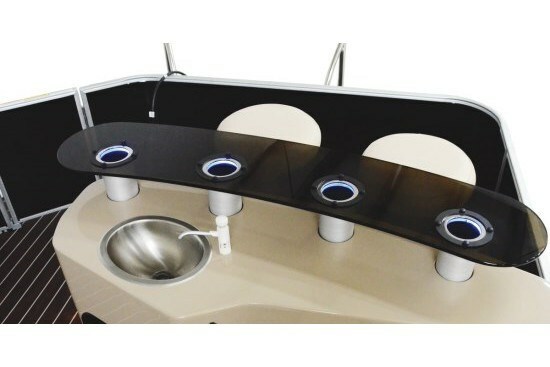 All furniture bases are of composite Roto-cast with integrated drains. Upholstery covering is Flex 48 Soft touch expanded vinyl. Each of these four lounges has two separated storage compartments beneath the seat cushion plus an additional storage cabinet below the angled headrest. The starboard side driver and port side passenger are each treated to a high-back reclining chair with headrest, armrests, and fore and aft slider adjustment. The driver faces a molded fiberglass helm with a charcoal black molded dash topped with a curved removable tinted windscreen, full chrome-bezeled instrumentation including speedometer, tachometer, voltmeter and fuel gauge, EZ-reset circuit breakers, tilt steering, a cup holder, and an AM/FM stereo with MP3 port and four speakers. 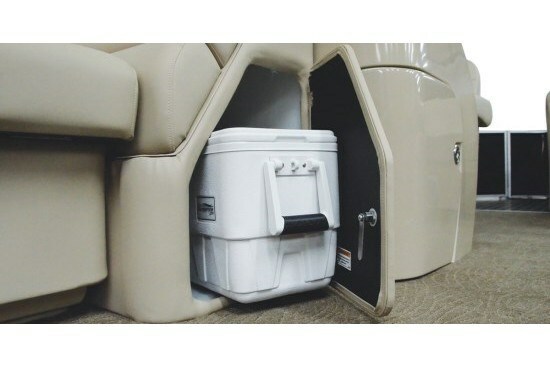 A portable cooler is always at hand and neatly stored in a dedicated compartment below the helm. 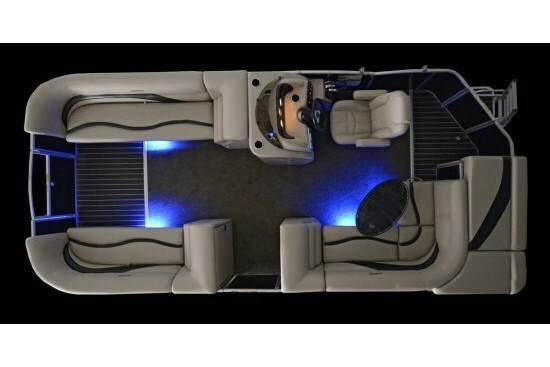 Interior underseat LED “mood” lighting is standard as is a pop-up privacy change room which neatly stores in the compartment under the headrest of the forward port side lounger. 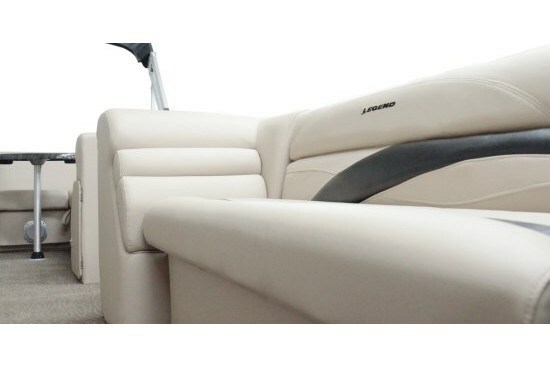 A bimini top also comes standard with the Luxura Lounge. 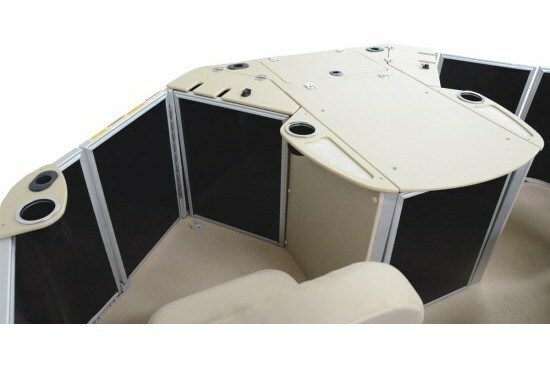 Over and above the seven optional motor choices, you may want to consider adding such optional equipment as various canvas coverings including full or half standup enclosures, a waterski/wakeboard tow bar, portable Napoleon marine barbeque grill, Humminbird combination colour screen depthfinder/fishfinder/GPS, or possibly even a trailer for your boat.